It's been a week since super typhoon Yolanda / Haiyan engulfed Tacloban in Leyte, and several nearby Visayan provinces in the country. Just Google "Yolanda" and you can read about the massive destruction and the aftermath of this typhoon that brought Philippines in a state of national calamity. Image from TruPinoyTV on Facebook. I feel helpless, seeing and hearing about what's happening on the news. We do what we can, no matter how small. I do feel grateful for the outpouring of love, prayers, and support from the global community, and the whole nation is thankful for all the help extended. For this post, I'll just focus on other avenues for us to contribute. 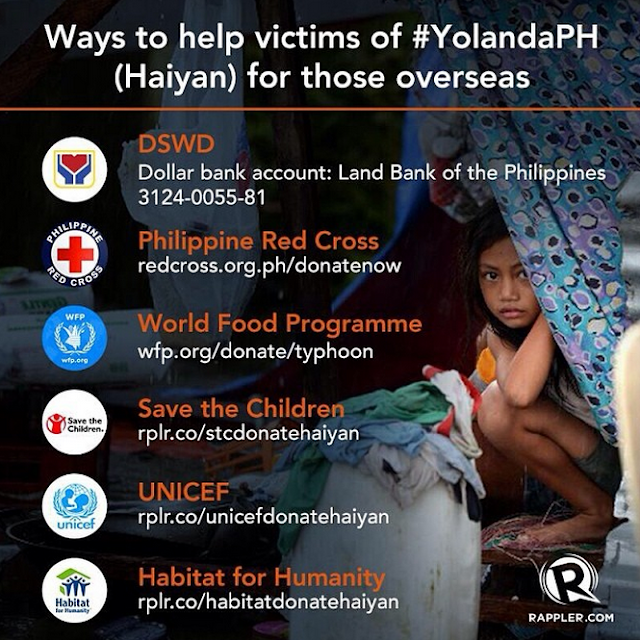 If you can't send cash donations or goods, here are 7 more "fun" and easy ways to help in sending relief. Click on the posters for links to the sources and details. 1. Dine for a Cause this Nov. 16 - 17. 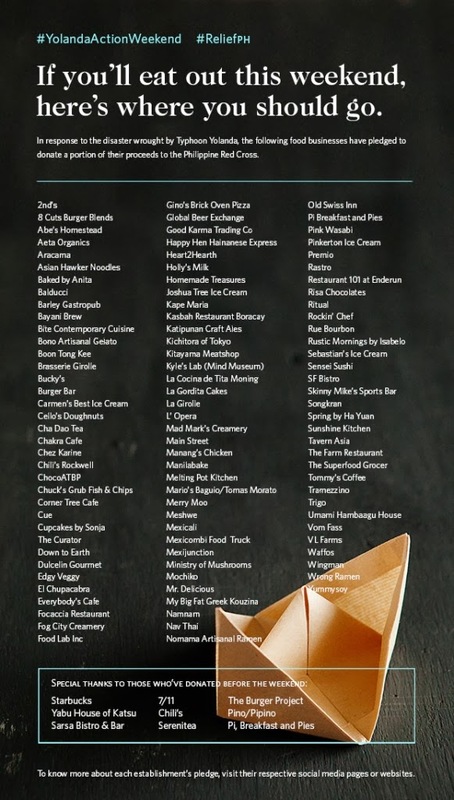 These participating restaurants pledged a portion of their food sales to Philippine Red Cross. 2. 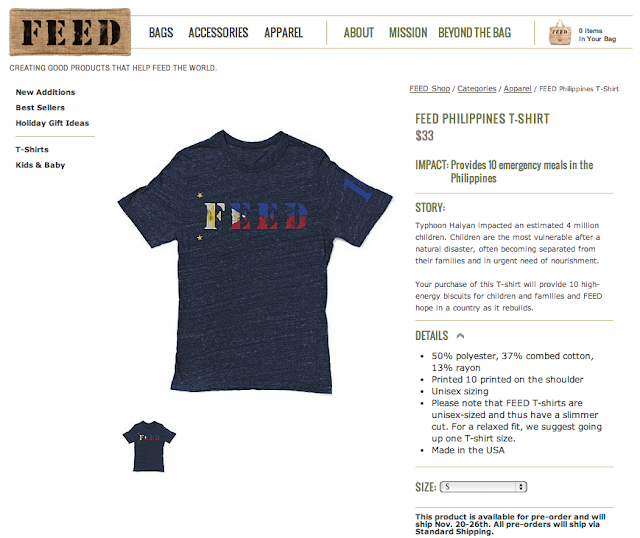 Buy a FEED Philippines Shirt - FEED will give 10 high-energy biscuits for every shirt sold. A cool and fashionable way to help! 3. 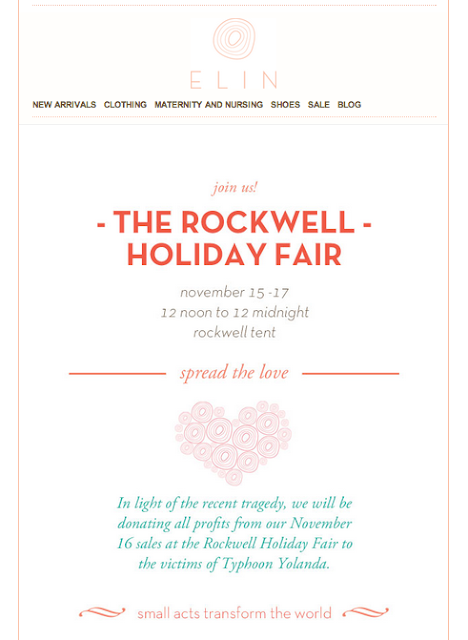 Shop at ELIN - one of my fave online clothing shops, will donate all profits from November 16 sales. 4. 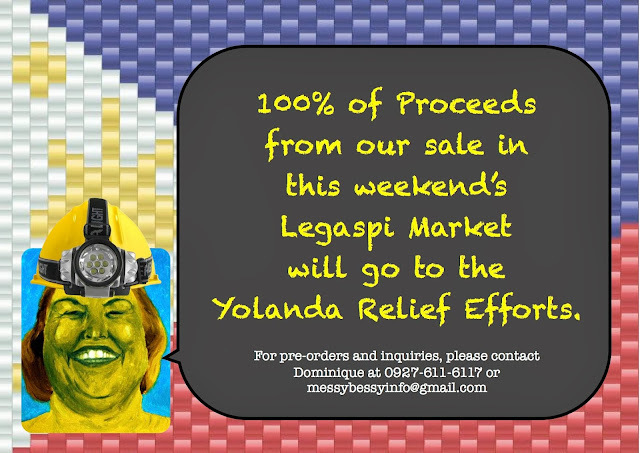 Shop MESSY BESSY household products - will give 100% of their profits from their weekend sale. 6. 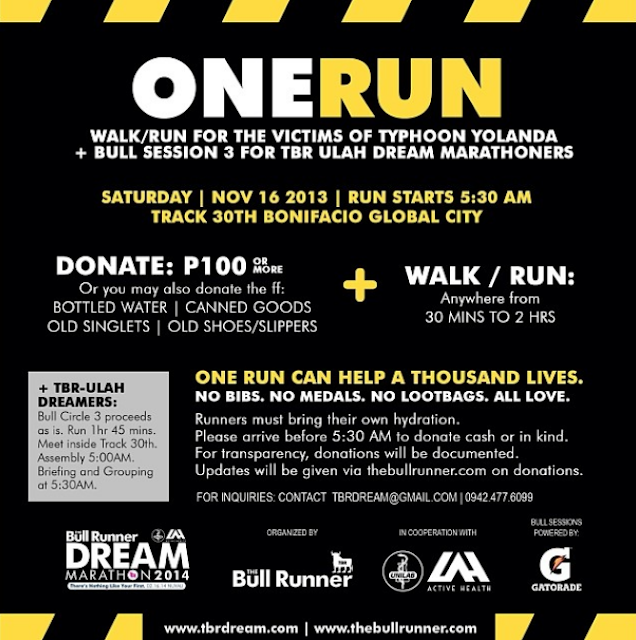 Run for a Cause with The Bull Runner. 7. 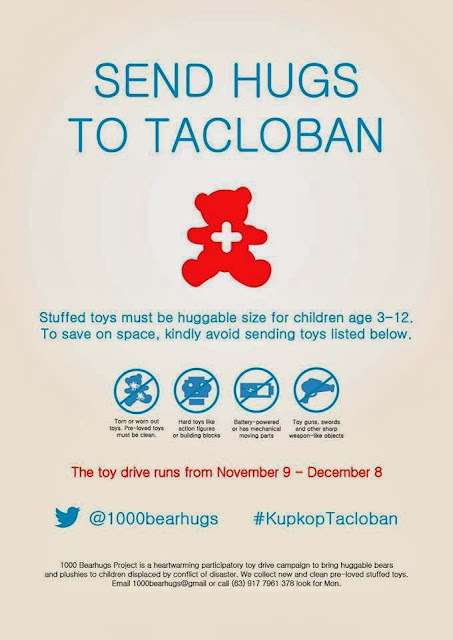 1000bearhugs - Send new and pre-loved plush dolls to be given to displaced children from the calamity. 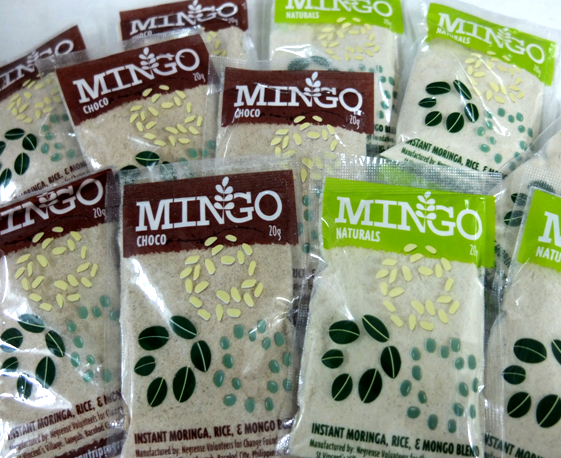 Babyland Stores, Mommy Mundo, and other list of drop-off points here in and out of Metro Manila. 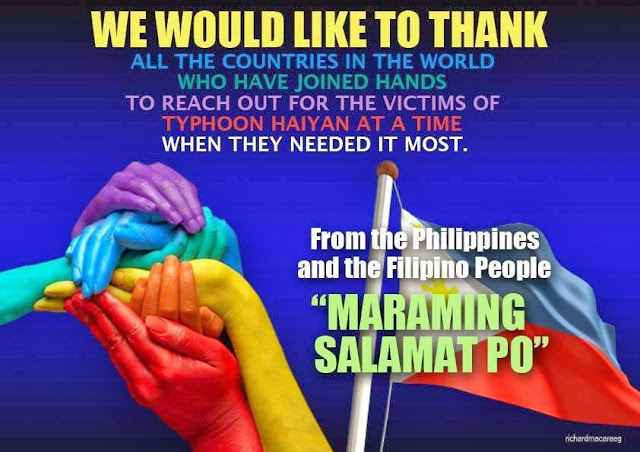 Let's us continue to pray for our kababayans in the Visayas.